Our “It Doesn’t Have to Hurt” video series has been funded by Knowledge Sharing Support Awards from the Nova Scotia Health Research Foundation (NSHRF). How many times have your kids been upset about going to the doctor because they’re afraid of the pain that goes along with getting a needle? Every parent (and health professional) wants to know how getting a needle can be easier for everyone. It Doesn’t Have to Hurt: Strategies for helping children with needles is a fun, light-hearted, and engaging new video aimed at parents and health professionals. In this video a young child advises her mom on some simple things that parents can do—and shouldn’t do—to help make the experience less stressful and painful. And the best news? These tips are all backed by scientific research. Watch the video and then please pass it on! Here is your chance to have your say! We are asking for your support and feedback by helping us to circulate this YouTube video and complete our anonymous survey to help us evaluate the video. French Translation (sub-titles): We’re excited to introduce this popular video with new French subtitles. Just click on the “subtitles/cc” button on the bottom of the YouTube video player. Nous sommes très heureux de présenter maintenant cette vidéo populaire avec sous-titrage en français! Vos enfants sont-ils troublés par la peur de la douleur associée à une piqûre? Ça n’a pas besoin de se passer comme ça. Regardez la vidéo de deux minutes du Centre for Pediatric Pain Research pour obtenir des conseils sur la manière de faciliter les choses pour tout le monde. Et vous savez quoi? Les conseils s’appuient tous sur des recherches scientifiques! 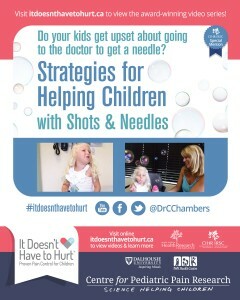 Ne manquez pas de remplir le court sondage à l’adresse http://pediatric-pain.ca/it-doesnt-have-to-hurt (en anglais seulement) pour nous dire ce que vous pensez de la vidéo. Ne manquez pas non plus de faire suivre la vidéo à d’autres parents et à des professionnels de la santé. Nous devons travailler ensemble pour réduire la douleur et la crainte associées aux piqûres pour que les enfants soient plus heureux et en meilleure santé. Spanish translation (sub-titles): We’re also pleased to announce that the video is now available in Spanish (April 2015). To turn on the sub-titles, click the “cc” button on the YouTube player to turn on the closed captioning then change to “Spanish” using the setting button. Thank you! We sincerely appreciate your support and feedback. 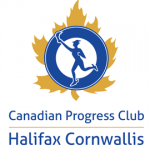 The Canadian Progress Club Halifax Cornwallis Charitable Foundation (CPC Halifax Cornwallis) for funding to assist with promotion of this video. The Nova Scotia Department of Health and Wellness and Affaires acadiennes/Acadian Affairs for their assistance with the French translation. Sous-titrage : Service de traduction, Division des Affaires acadiennes, ministère des Communautés, de la Culture et du Patrimoine, Province de la Nouvelle-Écosse, Canada.